The third person of the Blessed Trinity, the Holy Spirit, is sometimes referred to as "the forgotten" member of the Godhead. He is, no doubt, the least spoken of among the three persons of God, the Father, the Son, and the Holy Spirit. It’s no surprise that this is the case for many of us, since this most mysterious person of the Trinity has very little analogous correspondence with our visible and experiential reality. We can think about God the Father in terms of our own experience of our own fathers. We can even picture him as this kindly and fatherly old man with his signature beard and a twinkle in his eye (sounds like Santa Claus!) In the case of the Second Person, there is no problem picturing him as he is the most pictorially represented of the Three, and since we are dealing with a man who like us actually lived almost two thousand years ago in Palestine. But when it comes to the Holy Spirit, however, the matter becomes complicated. Since the Holy Spirit has not assumed any bodily form, it is impossible for us to imagine him in any concrete way. His old English title, “the Holy Ghost,” obviously did not help, even though we may picture him as the more affable and friendly Casper rather than the malevolent spirit in Poltergeist. His spiritual nature comes across as something ephemeral and non-tangible. The best visible representation we could possibly have of him is to depict him as a dove, since the gospels narrate how he descended upon Jesus in this form; or as tongues of fire as how the Acts of the Apostles described the event of Pentecost in today’s first reading. So, who is this most mysterious member of Most Holy Trinity? The third part of the Creed affirms this Truth: “I believe in the Holy Spirit, the Lord, the giver of life.” Just as the title “Lord” in reference to Christ is an affirmation of divinity, when the Church applies the title “Lord” to the Holy Spirit, she is saying that the Holy Spirit is truly God, co-equal with the Father and the Son. We also profess that the Holy Spirit is the “giver of life”. For the ancients, breath in the body was the sign of life. Then it came to mean the source or principle of life. God’s Spirit was involved in the production of all life in the world as we read in Genesis (1:2): “the Spirit of God was moving over the face of the waters.” It is the Spirit that gives life, both physical and spiritual. In order to have eternal life a man must be born “of water and the Spirit” (Jn 3:5). According to St. Paul, “the Spirit brings life” (2 Cor 3:6). So in the Creed we proclaim our belief that the Holy Spirit is “the giver of life”. But apart from these two theologically rich titles given to the Holy Spirit, the mention of the Holy Spirit in the third part of the Creed is also an affirmation that Christ's work of redeeming the world did not stop with his crucifixion and resurrection. Quite the contrary: those events were the launching pad, the beginning of a ministry that reaches its resolution only when the whole world is redeemed through the work of the Holy Spirit, a work which continues in the Church. And it is in the context of the Church that we must now find the Holy Spirit’s most profound mission. That is why at the beginning of every Mass, the priest says these words as the opening greeting: “The grace of our Lord Jesus Christ, the love of God the Father and the Communion of the Holy Spirit be with you all.” It would be highly presumptuous for him to arrogate to himself the sole responsibility and power to establish communion through his welcoming demeanour by substituting the above liturgical greeting with a more affable personal one, “Good morning everyone, How are you today?” The Holy Spirit is the One through whom Communion is achieved. Apart from him, no communion or at least permanent communion would be possible. In other words, the Holy Spirit gathers the people who are divided, knits and weaves them together into the Mystical Body of Christ. We must therefore remember that every act that seeks to foment disunity, create discord, cause divisions, or choose individualism over communal living (going ‘solo’ like the Lone Ranger), would be a sin against the Holy Spirit. Today, we labour under the illusion that harmony, peace and unity can only be arrived at through a suppression of the Truth. Many believe that Truth is divisive, that conflict arises as a result of conflicting ‘truths’, none of which is absolute. This myth is furthest from the Truth. Authentic unity is never the product of compromising the truth or blurring the lines between Truth and error, but is derived from a humble submission to the Truth. Love and communion must always be in service to the Truth. The contrast between Babel and Pentecost can also be seen here. The people at Babel sinned when they pursued their own version of the truth, but at Pentecost, the Holy Spirit enlightened the apostles and the first converts to the Church with the Truth of Christ. The first brought division, the second brought unity. 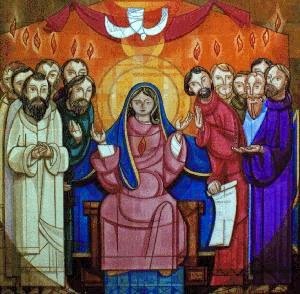 At Pentecost, the Risen Christ lovingly and mercifully pours forth his Spirit of Truth upon the apostles and He will remain with the apostles, their successors and the Church always because Christ is with his Church always, thus confirming the Truth that is authoritatively taught by the Church. If there is conflict and opposition, it is not because the Truth is its cause. Rather it is sin. Therefore, it is not enough that we should strive for unity and live in peace with one another, but we must also live according to the Spirit of Unity and Truth. And so, we must pray for the Spirit to enlighten and guide us to overcome the temptation to follow our own truths, and to welcome the truth of Christ transmitted in the Church. Life in the Spirit reassures us that we are not pathetic victims, huddling together whilst the storms of 'progressive' secularism consign us to the dustbin of history. We are the people of God, we are the Body of Christ, and we are the people led by His Spirit. We are called to proclaim the Good News of Jesus to a people who are spiritually starving and in desperate need of it. We have been made witnesses of the passion and resurrection of Christ, bearers of the Cross, and proclaimers of the Word of God, but we are also beneficiaries of the Spirit who refreshes, heals, inspires and always draws us into deeper communion with Christ and His Body, the Church.